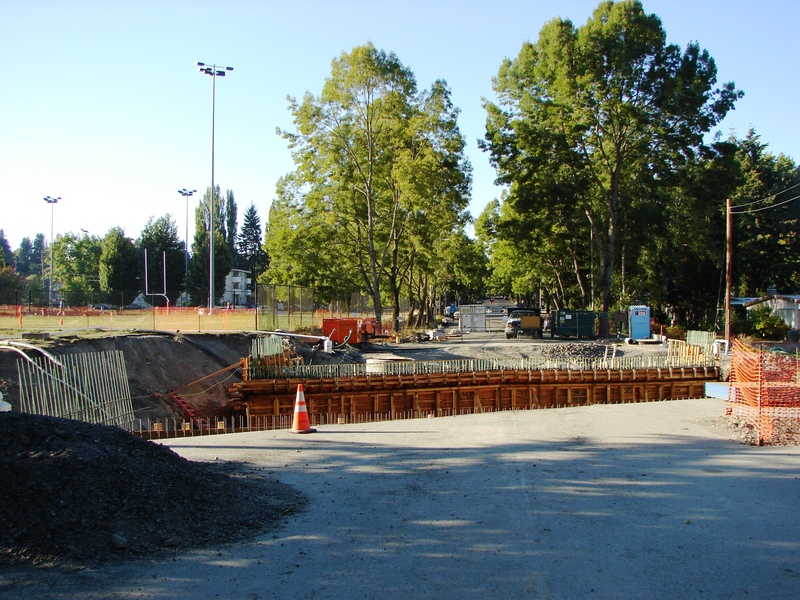 In the Summer of 2014 work is continuing on improvements at The Confluence, the joining-place of the north and south branches of Thornton Creek on 35th Ave NE at NE 107th Street. The two branches flow into Meadowbrook Pond, a water-filtration and flood control area created by the Seattle Engineering Dept. in 1997-98. In 2012-2013 the Pond was dredged and enlarged. In 2014 in this final stage of construction, the creekbeds near to the Pond are being enlarged and an adjacent flood plain is being created. Looking northward on 35th Ave NE we see the track and fields of Nathan Hale High School on the left. The Confluence construction work is to put in much larger culverts crossing under 35th Ave NE for the South Branch of Thornton Creek. The water flows eastward into Meadowbrook Pond. 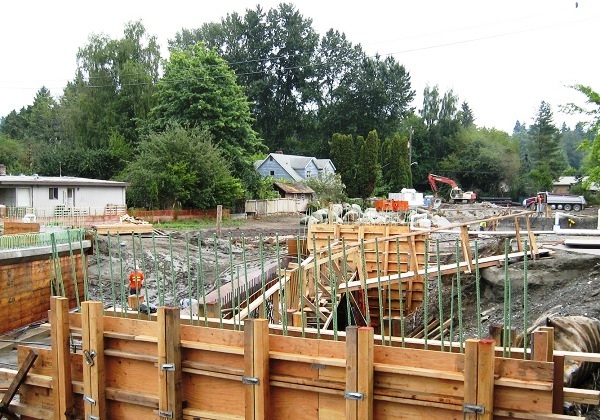 On the east side of 35th Ave NE we see the footings of the bridge which crosses 35th Ave NE, and the empty lot which will become a flood plain to hold the water of heavy rains. On the west side of 35th Ave NE, large poplar trees were cut down along the south branch of Thornton Creek because the trees were choking the channel and restricting the flow of water, leading to overflows in the parking lot and sports fields of Nathan Hale High School. On the east side of 35th Ave NE, an empty lot is being turned into a flood plain to hold the water of heavy rains, instead of overflowing onto 35th Ave NE. Log structures (using cut-down trees) will be used in the both the north and south branches of Thornton Creek as part of the meandering, slow-the-flow reconstruction of the creekbeds. This construction project necessitates the closure of 35th Ave NE at NE 107th Street. Traveling northward, one can go only as far as the Meadowbrook Community Center at 10517 35th Ave NE. –Completion of in-water work by the end of September, before fish start migrating upstream. –Connection of south branch to the main stem of Thornton Creek and to Meadowbrook Pond. –Complete the bridge across 35th Ave NE with its walls, sidewalks and barriers; install utilities across the bridge. –Resurfacing, paving and striping of 35th Ave NE. –Site restoration, to include landscaping and planting, fence installation, artwork installation. This entry was posted in Meadowbrook neighborhood, Thornton Creek and tagged flood control project, Meadowbrook Pond, road closure, The Confluence, watershed. Bookmark the permalink. Thanks for the update on Meadowbrook Pond, Valarie. I really appreciate it. Dang, I love open-top drives down 35th–very peaceful and close to home, too. Sounds like I won’t be able to do that until next spring. We may, but with the top on.